Our first Friday night at the White Eagle.....We were without James for this one as he was enjoying time with family on a beach in the East. 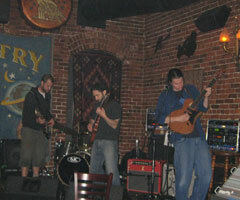 This was also our first gig using traditional guitar amplifiers. As such, we decided to forgo vocals and keep things on the instrumental side. Highlights included; a different take on Big Dave's Big Day, a Big Jam, and a smokin' Oregon debut of 3-D. Our friends from Alpaca! then came on and capped off a sweet evening.